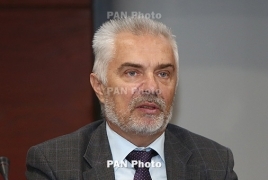 PanARMENIAN.Net - The liberalization of the visa regime with the European Union may be concluded by 2020, head of the bloc's delegation to Armenia Piotr Switalski told reporters on Monday, November 27, Sputnik reports. According to him, the Comprehensive and Enhanced Partnership Agreement signed on November 24 between Armenia and the EU clearly stipulates the conditions for liberalization of the visa regime. According to him, legal, administrative and institutional reforms requiring long-term commitment should be implemented for this purpose. "We, together with our colleagues, will do everything possible to implement this agreement, which is so important for both parties," Switalski said.